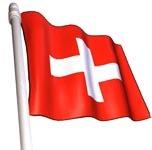 ZURICH, Switzerland, Nov. 30 -- Final election results in Switzerland show voters rejecting a proposal to decriminalize marijuana, but passing a plan for prescription heroin. The BBC said Sunday that the prescription plan will allow addicts to shoot up under medical supervision in a clinical setting and is aimed at getting hard-core users off the streets. While critics said the idea sent the wrong message to young people, about 68-percent of Swiss voters seemed to agree with the argument that it would cut down on crime and keep addicts off the streets.